NBCUniversal is among the world’s largest entertainment companies, bringing “the development, production, and marketing of entertainment, news and information to a global audience.” From television networks and a motion picture company to theme parks and Internet-based businesses, NBCUniversal is the perfect place for an MBA to put their degree to work. Both NBC and Universal were founded in the early 20th century, with Universal opening in 1915 as “the only moving-picture city in the world” and NBC as the nation’s first permanent radio networking beginning in 1926. Over the years, the companies have been responsible for some of the most memorable moments of entertainment history, such as the 1936 Berlin Olympics broadcast over NBC Radio, hosting the first presidential TV debates between John F. Kennedy and Richard Nixon on NBC in 1960, and the premier of now-classic films like Back to the Future on Universal. In 2004, NBC and Universal officially became one company—NBCUniversal—joining together cable networks like USA, SCI FI, Bravo and others with Universal’s movie studio and theme parks in Hollywood and Orlando. With such a vast portfolio of companies and networks within NBCUniversal, someone with an advanced business degree can find a number of places throughout the company that can benefit from their in-depth business knowledge and leadership. Roles are available at the company all throughout the country in a number of business fields such as Human Resources, Business Development, Communications, Finance & Accounting, Marketing, Ad Sales, Public Relations, and more. NBC Universal offers a number of Internships and Campus 2 Career programs that give opportunities to both undergraduate and graduate students, with many of these opportunities can lead to full-time roles. Through the Campus 2 Career center at NBCUniversal, a number of roles are available in fields like Marketing, Human Resources, Web Content Management, Ad Sales and more. Every semester, recruiters from NBC Universal request interns through the Campus 2 Career center. The company also hosts special recruiting and networking events, working alongside organizations such as the Society of Hispanic Engineers or the National Black MBA Association (NBMBAA). Typically, internships at NBCUniversal run from three to four months long, coinciding with the school semesters. The internships are paid, although salary varies by department, and—while not guaranteed—can often result in getting hired for a full-time role with the company. For recently graduated MBAs, the company also offers a number of Early Career & Leadership programs, such as the East/West Coast Page Program or the Experienced Commercial Leadership Program. Through the Campus 2 Career program, NBC Universal has a number of openings for interns in a variety of business departments. Below are just some of the roles currently available at the company which specifically seek MBA candidates. NBCUniversal is dedicated to advancing the careers of individuals who are passionate about their work and want to move into higher-level management or leadership roles. Programs like the International Future Leaders Programme expose early-career post-graduates to four different roles over the course of two years, allowing them to experience work in all three of the company business units. Participants in this program will also gather together at the end of the program to work on a project with a real impact within the company. They will also attend a number of courses specifically designed to train up-and-coming managers. 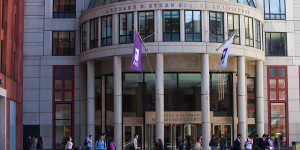 Programs like the NYU Stern School of Business full-time MBA, which gives students an opportunity to focus their studies towards earning a career in the entertainment industry, give a definitive advantage. Several Stern MBA grads do, in fact, work with the entertainment giant. Even if the path of an MBA may not be your preferred journey, you can always become a page.